Many, and perhaps most, prestige television shows traffic in death. Name your top five dramas right now and chances are good the majority are about people who kill other people for a living, or at the very least on a pro-am basis. Yet for all their fixation on mortality, violent or otherwise, few shows bother attempting to answer the unanswerable question of what death feels like. The one that (maybe) gave it a serious try wound up doing something so strange by the standards of its peers that we’re still talking about it eleven years later. It’s probably wise to avoid saying “from which he knows there will be no return” here. 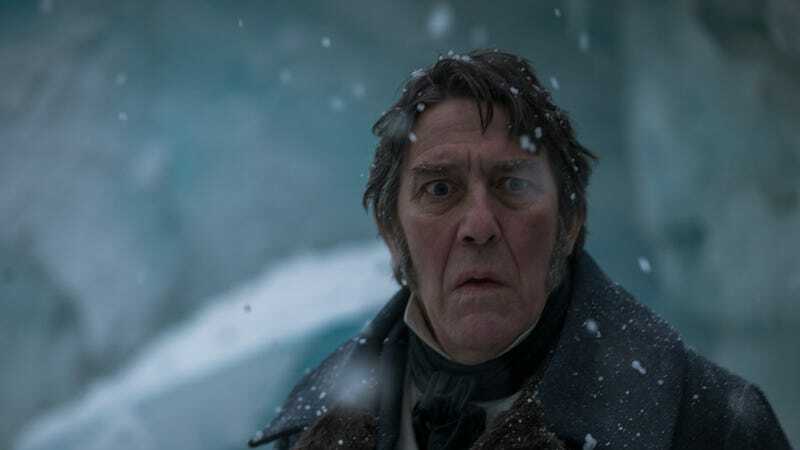 There’s nothing in Sir John’s wide-eyed, slack-jawed stare, in his inarticulate noises of fear, or in his final agonized scream to indicate he’s anything but desperate to be and stay alive until the very end. Once the bear, or whatever it is, that’s stalking his men gets him in its clutches, director Sergio Mimica-Gezzan uses fluid camera movement to prolong Sir John’s suffering in an almost physical manner. As he’s sent tumbling upside-down, the scene cuts away to a vision of his palatially appointed home, where his head continues to spin as if his death had been years in the making. When the show cuts back to the present moment, his head remains static and terror-stricken as it hangs upside-down in the lower right corner of the frame while the white ground flows by beneath him, a profoundly troubling way to convey his total helplessness against the huge force of nature that has him in its clutches. Franklin gets tossed to the ground near the same hole in the ice where his men unceremoniously deposited the body of the Netsilik shaman who was accidentally shot and killed last episode, where he has just enough time to look back and see his leg has been torn off before the beast pushes him down into the hole as well. Finally, he comes to rest on the burning brazier keeping the hole clear; you can hear his animalistic grunts and the sizzling of the coals against his body until the chains holding him up give way and he plunges into the freezing water, gone forever. There’s not a second in this entire sequence that doesn’t feel like a panic attack, or the seemingly eternal seconds between when a car accident you’re involved in begins and ends. For Franklin to disappear so completely at the end of a sequence that depicts his physical and psychological experience of dying so vividly feels somehow obscene. Only bloody water and a severed limb remain to let anyone know he was even there. While Sir John’s death is the obvious highlight of the hour, the strength of Gina Welch’s script before and after the event shouldn’t be underestimated either. In many ways the entire episode is one giant act of misdirection, setting up a conflict between Sir John and his second-in-command Captain Francis Crozier that the killing renders moot. Francis was ready to risk his entire career to defy the orders of Sir John and send out a party to seek rescue from an outpost hundreds of miles to the south before they all find themselves frozen in for a second winter. Crozier’s pessimism cracks Sir John’s cheery disposition into tiny shards. He lambasts Francis’ attitude, his alcoholism, his supposed vanity, and—most harshly—his ambition to marry into the family. “There were some things we were never meant to be to one another,” Sir John proclaims. “I see that now. Friends on my side…relations on yours.” Again, for this kind of go-for-the-jugular fight, and Captain Crozier’s subsequent decision to go AWOL, all to take place for nothing because of Franklin’s death makes that death all the more awful. In fact, the entire expedition loses its secret raison d’être when the bear-thing destroys its leader. In an early flashback, we learn that Franklin and his wife Lady Jane, the latter in particular, saw in the potential discovery of the Northwest Passage a chance to redeem his reputation after his governorship of Van Diemen’s Land (now Tasmania) went disastrously wrong. Minutes after we learn this secret, and come to understand how it undergirds his rally-the-troops, full-speed-ahead optimism with pure desperation, Franklin is dead, having lost his last big gamble and left behind dozens of men to carry on in its name. And on the level of pure horror-genre filmmaking, the death is preceded by foreshadowings and fakeouts galore. 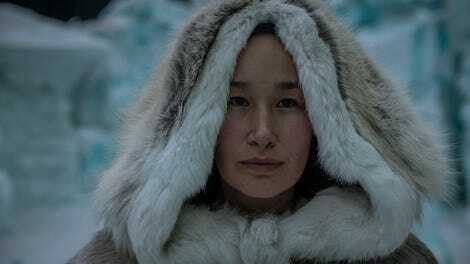 While preparing the Inuit shaman for burial, a pair of crewwmates discover tiny ivory figures in his coat, one of a bear with a dinosaur-length neck, the other of a man in a mask matching the one seen in the vision of the dying sailor from the pilot. They opt to leave the figures on the dead man’s person before dumping him into the ice, seemingly out of respect. But the man’s daughter, now nicknamed Lady Silence by the crew since she hasn’t said a word since her father’s death, clearly wanted them; now they’re as lost as her father and Sir John. The minutes leading up to Sir John’s gruesome demise are pretty much an experiment in excruciating tension. Armed with booze and his usual good humor, Franklin pays a visit to the men manning the hunting blind where they’re attempting to lure and kill the bear with the carcasses of rats captured aboard the ships. He also brings along Dr. Goodsir and a camera, so he can pose for a portrait with the hunters. Goodsir spends an agonizing half-minute just waiting out the exposure on the contraption, and every one of those seconds is an opportunity for the bear to roar into the frame and slaughter the crew. After it’s over, the sense of relief is so overwhelming that the fear seems silly in retrospect—until the bear does appear, tearing men to shreds. The episode ends with Captain Crozier in command, reading a eulogy for Sir John that the man himself wrote for the lieutenant killed in the previous episode—a rumination on Jacob’s ladder, and the watchful presence of a benevolent God. But the watchful presence stalking the Erebus and the Terror destroyed the man who wrote this sermon. In doing so, it unlocked a new form of dark magic for this already mesmerizing show to wield. After the unrelenting awfulness of Sir John’s final moments, the sight gag of seeing his sole remaining half-leg as it’s lovingly prepared for burial brought forth what horror writers call hysterical peals of laughter. It was just too much, man. In the final scene, we watch as Lady Silence, camped out in a snow house near the ships, receives the gift of a slain seal from the still-unseen bear, whose breath is powerful enough to blow the sealskin door of her dwelling like the wind. At this point you start to wonder, if you haven’t already, if the manner of Sir John’s disposal, so much like the way his men ditched the corpse of Silence’s dad, was more than accidental. Once again, composer Marcus Fjellström’s contributions to the atmosphere of the show are invaluable. The broken-down piano whirl that accompanies Sir John’s flight, capture, hallucinations, and death sounds perfectly wrong. And it’s not even the most memorable musical moment in the episode. That honor goes to the crew’s moving singalong to “Farewell All Joys,” led by a dazed crewman who suddenly forgets the words. Sir John isn’t the only guy getting his hopes dashed. Cornelius Hickey discovers that his lover has ratted him out to their superiors in an attempt to come clean and save them from getting whipped, or worse. Hickey brags about the drink he and Captain Crozier shared, which he feels indicates he’s going places in the Navy and will be able to pay back this kind of disloyalty. “He’ll offer anyone a drink if he can have one too,” his erstwhile “wife” replies, dashing his hopes. The moment Sir John tells Francis he’s the kind of man who’s happiest “with a glass of knock-me-down in one hand and an alarm bell in the other,” you know it’s on. Devastatingly nasty. “Educate this creature as to the Dominion of the Empire and the will of the Lord behind it.” Be careful what you wish for, Sir John.